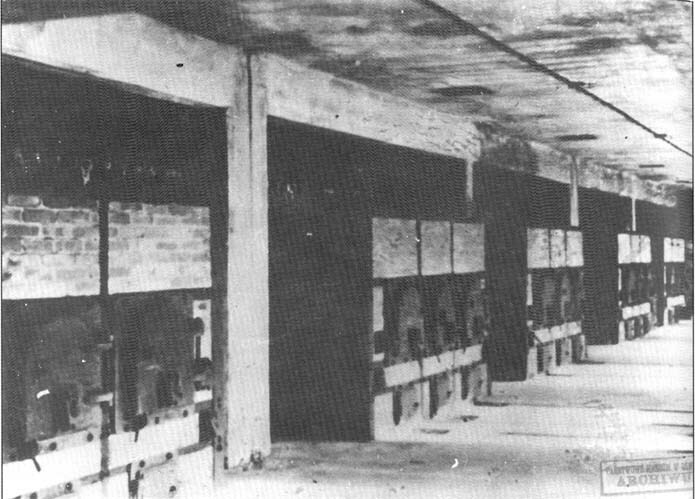 East-west view of the furnace room of Krematorium II taken on the same occasions as Photo 4, in the first half of January 1943. From right to left: the three-muffle furnaces 4, 3, 2 and 1. The openings below the muffle doors were to collect human ashes. The four small flaps on each furnace, two at each end of the set of three doors, were used to regulate the draught. For this picture, Kamann had all the doors closed that were open on the previous one, except for the center door of furnace 1 (far end). In the foreground, the shallow slope of the narrow gauge rails running down to Leichenkeller 2 can clearly be seen. After the rails were removed, the floor was concreted. West-east view of the Krematorium II furnace room taken towards the end of January 1943, probably on the 25th or 26th, when the furnaces were being warmed through before the inspection on 29th January by representatives of Topf & Sons, the manufacturers, and members of the Bauleitung, the customer. According to Pery Broad, this photo already had a certain fame at the time. From left to right: three-muffle furnaces 1, 2, 3, 4 and 5. The rectangular holes in the ceiling in front of each furnace were for ventilation. The three sets of 40 cm gauge rails set in the floor perpendicular to each furnace were for corpse charging trolleys identical to those used in Krematorium I. Bottom right is part of the low trolley carrying the turntable used to position the charging trolley on the rails before the desired muffle. This mobile turntable moved on two angle irons about 90 cm apart set into the concrete floor running at right angles to the other sets of rails and thus linking them. The charging trolleys were subsequently abandoned in favor of the simple and easier to use “corpse stretcher”. Despite the fact that they were of no use, the fifteen sets of rails were left in place (and can still be seen today). On the other hand the turntable rails running the length of the room were removed and the space was converted into a shallow concrete trough that was filled with water so that bodies could be easily slid along it from the corpse lift to the furnaces. At the far end of the furnace room is the door to the corridor leading to the Capo's room, the furnace irons store, the WC and shower and the prisoners' rest room. The stairs to the roof space are just beyond the entrance to the corridor, on the left. The electricity supply was already installed, but the lamps do not seem to be in place yet. The incineration capacity of the five three-muffle furnaces of one Krematorium of type II/III was established in 1945-46 by the technical “expert” engaged by the two Commissions (first Soviet, then Polish), Professor Dawidowski, in line with the accounts of former Sonderkommando men, as being 2,500 corpses a day, which they claimed could be pushed up to as many as 5,000. These fables. such as the incineration capacity being 18,000 a day and capable of peaks of 24,000, the maximum gassing capacity of the extermination instruments being estimated at 60,000 in 24 ours and the total number of victims being 4 million, are now recognized as being “emotional” figures, bearing no relation to reality and resulting from the shock of unbelievable events that were still very close in time. Messrs Topf & Sons, who had supplied the three muffle furnaces, claimed that a battery of five would leave a normal “productivity” of 720 corpses in 24 hours. Their designer, the Topf chief engineer Kurt Prüfer, estimated that the actual yield of his three muffle furnaces had exceeded his expectations by one third, reaching almost one thousand cremations a day for a type II/III Krematorium. The figure of 1,440 for Krematorium II or III officially communicated by the Auschwitz SS to their superiors at the end of June 1943 is a purely administrative figure, obtained by calculation. In the non-criminal plans for this type of Krematorium, formulated at the end of December 1941, the cremation rate was to be 60 corpses her hour, so once the installation was completed the capacity must be 60 × 24 hours = 1,440 per day. It was unthinkable to admit that the actual result was less than this, and indeed any lesser figure might be interpreted as sabotage. This rate of cremation, over one third higher than Prüfer's figure, was based on absolutely flat out working 24 hours a day. Even if it was attainable in practice it could not be maintained for long without causing damage to the installation and necessitating a shut down for repairs. 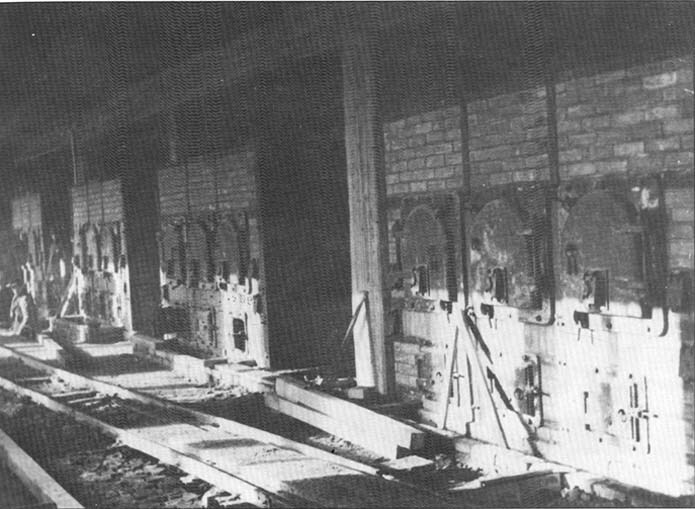 The Buchenwald concentration camp had two three-muffle furnaces of the same model as the ten in Birkenau. At the Liberation, those at Birkenau no longer existed, having been dismantled in December 1944, while those at Buchenwald were intact. To this day, there has never been a comparative study of this type of furnace to find out what the actual throughput was. Despite this lack, the present state of knowledge makes it reasonable to say that the daily throughput of Krematorium II or III would have been in the order of 1,000 corpses, whereas the official publications indicate a minimum of 1,440 (based on the SS letter of 28th June 1943), a figure already considered inflated (by well over a third) and a maximum of 5,000, a figure which is technically impossible and is simply a reflection of the emotional context of the immediate post Liberation period.